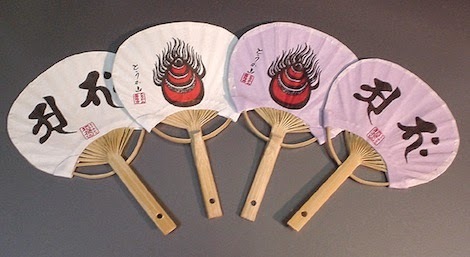 The hand fan, folding fan is often used as a prop in Japanese traditional dance, kabuki and no performances and comes in many forms and varieties. Since its original purpose is to bring some cool air to the person, it is used as a kigo for summer. The sight of a mother fanning her baby with a round fan (uchiwa) is still a very sweet memory of the good old times. The impregnated fan was impregnated with the juice of the persimmon (shibugaki). Nowadays they are coated with plastic and used as commercials at summer festivals. A white fan could later be painted by a friend or famous person. To get such a present is quite an honour and you can display such a fan with a special stand in your home. The culture of using fans is quite old, since the Japanese summer can be quite hot and humid and even a little breeze could be a refreshment. "ritual of the first summer"
..... oogi no hai 扇の拝（おうぎのはい） "audience with fans"
Court ceremony on the first day of the fourth month (of the lunar calendar), dating back to the Heian period. After the banquet, the emperor gives away hand fans to the participants. During the coming hot summer months, ogi were put into a box (yanai bako やないばこ【柳筥】) made of willow tree wood, so the fans could be freely used. moo 孟 siginifies the beginning of a season. The following copy from a store in Kyoto selling fans will give you an impression of the long and detailed cultural value of a simple thing like a hand fan. 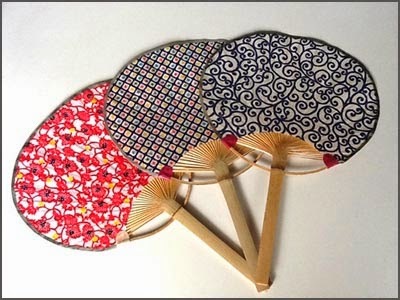 In addition to fans for cooling yourself in the hot weather, there is a great variety of traditional Japanese folding fans which are used for ceremonial occasions, traditional drama and dance performances, and also used decoratively. There are five different styles and schools (called Nougaku-goryu) in Noh performance, the oldest Japanese form of drama, and each school uses its own distinct type of fans, which differ in framework shape and engravings. 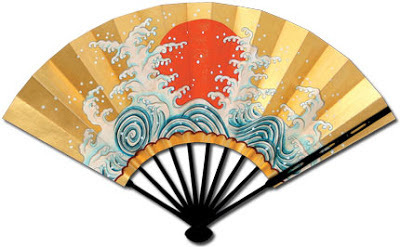 The paintings on fans also vary according to the Noh school: Kanzemizu (flowing water) is for the Kanze school, Mitsugumo (three clouds) for the Kita school, Itsutsugumo (five clouds) for the Houshou school, Gosei (five stars) for the Konparu school, and Kuyousei (nine stars) for the Kongou school. This kind of fan is generally about 23 cm in size for the men's version, with a smaller type for women, usually about 20 cm across. A great variety of Natsu-sen have developed over the years: some have curved main frameworks to go well with kimono, or are made by pasting silk on a framework instead of paper, or by pasting washi (Japanese traditional paper) and silk together on the framework. These fans are made of sandalwood, and keep their unique fragrance of sandalwood for a long time. 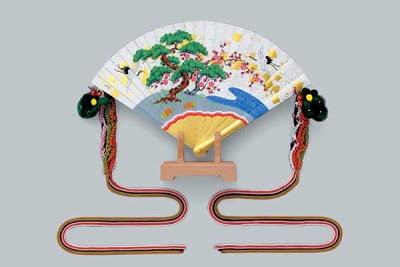 This fan is usually made by binding thin plates of sandalwood with strings in the same way as the hi-ougi (described below), or by pasting washi on a sandalwood framework. 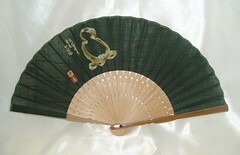 A fan for taking to the tea ceremony. The size is generally about 15 cm for women and about 18 cm across for men. Decorated with a variety of designs, including passages quoted from the 100 poems about the rules of preparing and serving tea by Rikyu, the founder of the Japanese tea ceremony; emblems of the Sen-ke school, founded by Rikyu, or symbols of flowers and sweets suitable for the tea ceremony. Shu-u-gi-sen fans are formally exchanged between a man and woman at meetings with a view to marriage, or used in wedding ceremonies. 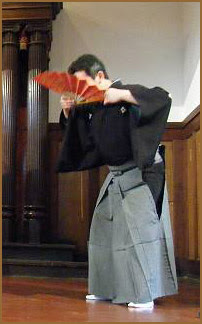 There are two types of Shu-u-gi-sen for men: a traditional hoso-hone Haku-sen type (thin-framework white fan), and a type for use with Western dress suits. Mourning fans are dark gray with a black-colored framework and are used only at funerals. Decorating your alcove or wall with this type of fan creates a distinctly Japanese mood. 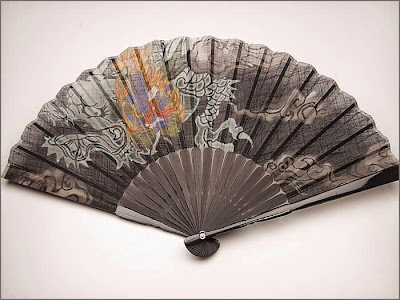 Fans with India-ink paintings or drawings make very good gifts. Made by binding thin strips of Japanese cypress with silk strings. 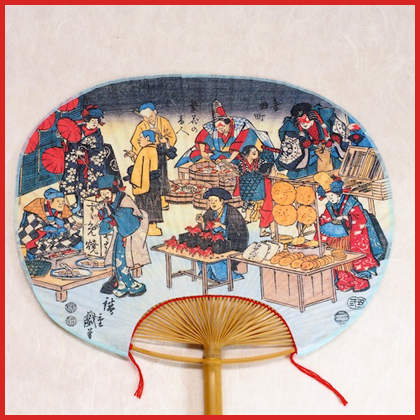 A very classical Japanese fan, now mainly used in Buddhist temples, Shinto shrines, or in traditional ceremonies at the Imperial Court. The hi-ougi for Buddhist or Shinto priests is not decorated with paintings and has no accessories, but those for court ladies or used in the Urayashi-mai (Japanese traditional court dances) are very richly colorful and have accessories, such as decorative flowers and five-color fringes. Ceremonial fans for monks. The chu-u-kei is a fan whose head part is wider than its grip part when folded. A bonbori is a simplified form of chu-u-kei and is mainly used by Buddhist missionaries. 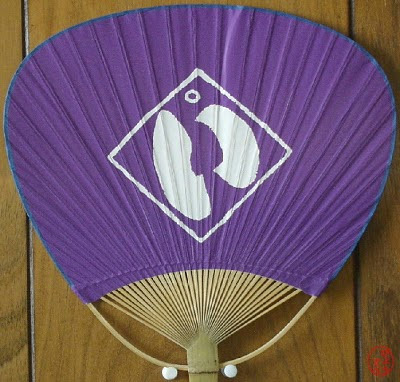 The onatsu-sen was designed as a daily-use fan and its head part is unfolded to only about half the size of a chu-u-kei. Fans for dolls. The size is between about 3 - 9 cm. Selectable according to the type of doll. A whole page with samples of round fans. uchiwa maki 団扇撒 (うちわまき) "scattering fans"
At Temple Toshodai-Ji 唐招提寺 on the 19th of may, the death anniversary of the temple founder Ganjin 鑑真和尚. Small insects are driven out from under mosquito nets and out of the temple, to show mercy for them and not kill them.
. tama oogi 宝扇 treasure-fan . mizu uchiwa 水団扇 / 水うちわ（みずうちわ）"water fan"
They were first made by the Kasuga Shrine for its festival, and soon became a trade-mark item for Shrine festivals all over Japan.
. Doing Business in Edo - 江戸の商売 . Soon after takeoff it became quite hot inside the aircraft, after all the Gobi Desert was below our eyes, a breathtaking sight, but that is a different story. The stewardess anounced: "Our airconditioning is out of order, so please use the hand fan we provided for you to keep comfortable." I still keep this little one (or rather two, my husband got one of course) to tell the story of non-electric happiness. And it did not loose its nice smell even after more than 20 years. 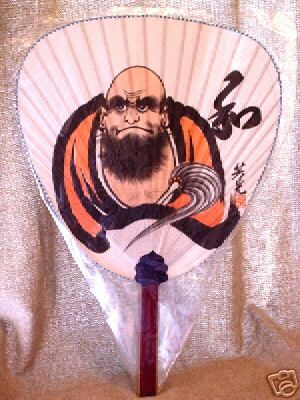 Hand Fan (uchiwa) with Daruma san. In the town of Edo he walked around before the New Year and sold cheap fans with auspicious symbols for the New Year (mount Fuji, a hawk, eggplants or the 7 Gods of good luck) in small wooden boxes. They were used as "obligatory presents" to teachers, doctors and other important people (it is said to be the fore-runner of the famous "o-toshidama" money presents of our day). o-harai oogibako お払い扇箱 "Buying back fan boxes"
and payed a small sum. They kept the boxes till next year to start another round of business.
. O-haraibako 御祓箱 box to transport talismans . The real name of the fan shop, 美影堂 Mieidô, is partly visible on the signboard in the shape of a giant fan overhead. 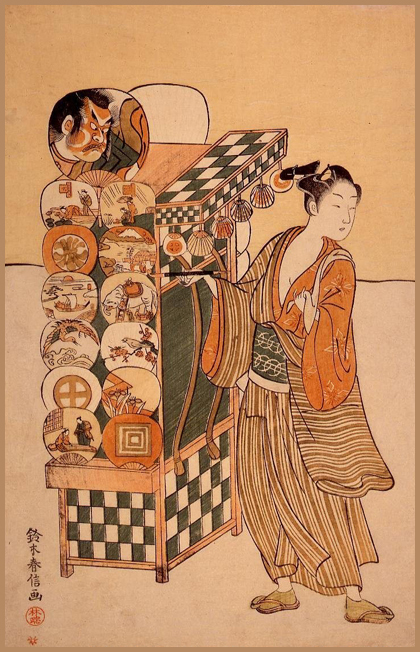 As a joke, the name and trademark of the publisher, Eijudô, are substituted for the shop name elsewhere in the picture.
. Edo shokunin　江戸職人 craftsmen of Edo . 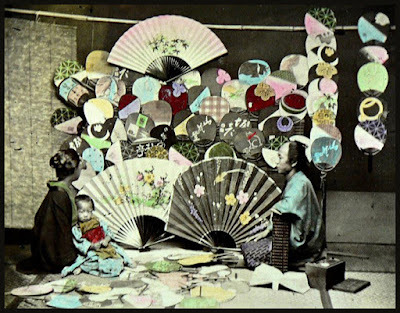 Handfans were used all year to start and keep the kitchen fire in Edo. These fans were especially strong and the paper was coated with kakishibu　柿渋 persimmon extract to make them some kind of water-proof. They were also useful to hit flies and mosquitos. 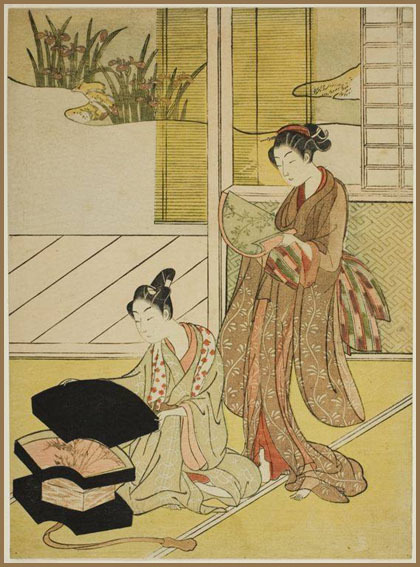 Since the late Edo period women used to carry a handfan all the time, especially as a fashion item when going out. Edo Uchiwa is a type of uchiwa, a traditional Japanese fan. Uchiwa is often used by a person to create a breeze to keep cool in hot weather. They are part of Japanese seasonal traditions and are often given as gifts at these times. Originally, a big leaf and an animal hair were used as an uchiwa, to purify and pray. Over time they have changed, and are now made from one piece of bamboo and paper. It is said that uchiawa originally came from China. During the Edo period in Japan, there were uchiwa's that was called Edo Uchiwa which used the Ukiyo-e technique with printing such as kabuki actors, landscapes, and portrait of beautiful women. Nowadays, in summer, you will see uchiwa everywhere in the street, which have not a printing of Ukiyo-e, but an advertisement of companies or products. 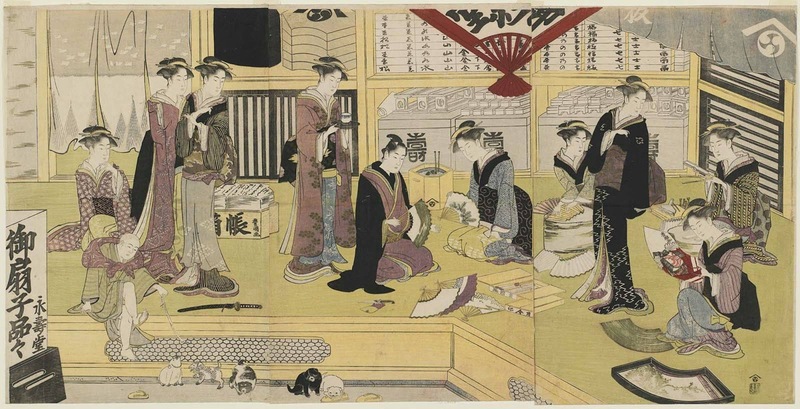 and also Ukiyo-e with people using an Uchiwa in the Edo period. They show many aspects of the daily life in Edo and will be a source of further study.
. Join the Edo friends on facebook ! .
. 与謝蕪村　Yosa Buson in Edo ! . 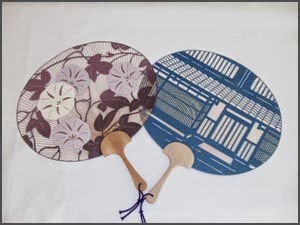 With the high temperatures and similarly high humidity of Japanese summers, the uchiwa, or Japanese fan, has long been a vital summertime accessory. Uchiwa are even distributed on the streets as advertising tools when the temperature rises. As a common item in daily life, Chiba Prefecture’s one and only government-designated traditional craft, the Boshu uchiwa, is widely known across the nation. Boshu uchiwa take various forms: the standard round-shaped type; the “egg type,” which features a unique, smooth curve; and a long-shafted type, which allows the wielder to see the design move when it’s spun with the palms of the hands. Boshu’s status as a bamboo production district allows the use of high quality bamboo to achieve these various shapes, conjoined with unique shafts that make the most of bamboo’s natural roundness. Boshu uchiwa are hand-manufactured in a 21-step process that starts from the peeling of the bamboo. The handle is light and durable, and has a bone structure made by dividing one end of the shaft into 48 to 64 equal parts, woven together by yarn. Combined with a beautiful semicircle lattice design known as a mado, or window, this is an uchiwa that highlights the refined skill of the craftsperson. 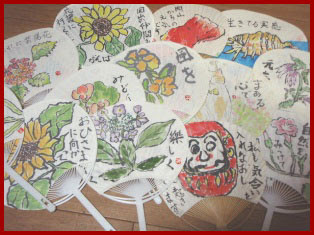 Visitors to the area should enjoy cooling down in the summer with a storied Boshu uchiwa.
. Chiba Folk Art - 千葉県 . 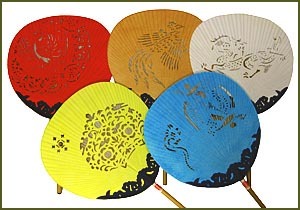 Kyo uchiwa fans are believed to have developed after Korean fans brought to Japan by pirates between 1336 and 1392 influenced the designs of the fans used by the Japanese imperial household. These were then brought from Kyshuu to Yamato Province, and from there to the Fukakusa area of Kyoto. It is here that Kyo uchiwa fans became established. As the generations passed, these fans became more and more a ubiquitous element of Kyoto life. Today, new ideas and creative variations continue to be incorporated, producing new items of elegance and beauty that cannot be seen elsewhere in Japan. The primary point that sets Kyo uchiwa fans apart from others are their embellishments and rich, beautiful designs. However, a more concrete difference is that Kyo fans feature a body inserted into an independently made handle. The number of spokes varies from 50 to 100, with more spokes indicating a higher class of fan. Those with 100 spokes are considered decorative fans. Bamboo handles are common, but cedar is also employed. The handles of some fans are given a lacquer finish. Or: "her left hand fanning." Edo is present-day Tokyo. Shinji Ogawa explains that the phrase, edo no mizu nomu ("to drink Edo's water"), is equivalent to "being in Edo" or "living in Edo." The phrase, "left hand fanning" (hidari uchiwa) is an idiom in Japanese for "living comfortably." Shinji believes that "this haiku is Issa's cynical remark about his contemporary haiku-poets living in Edo." There are 37 haiku about the fan by Issa. Considering the use of MO, this might refere to the famous pine where Minamoto no Yoshitsune rested. There are some places in Japan that claim this pine. 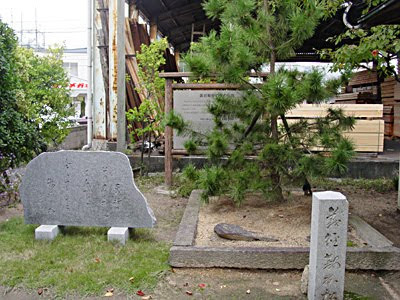 Near Yashima Station there is a small area with a pine tree beside a small shrine. The pine tree is famous, because it is believed to be the spot where Yoshitsune, the leader of the Minamoto clan during the Genpei War, rested prior to the Battle at Yashima. It is said that he rested at this location and placed his saddle on the pine tree. It is a historical site that a traveller who is interested in the history of the Genpei Wars (or the famous Tales of Heike, which was written about this war) should visit. Because it is near the station, visiting the famous pine tree is also a nice way to pass the time while waiting for the bus that takes you up to Yashima Island and Yashima Shrine. An electric appliance used in many homes now. In the hotter areas of Japan and the USA, it might be used the whole year round, but as a kigo, it refers to summer non the less. Its effect, the cooling of rooms, evokes the heat of summer days.
. WKD : Serbia Saijiki . fuyu oogi 冬扇 (ふゆおうぎ) "handfan in winter"
He was referring to himself, his poetical activities were useless compared with the wishes of other people. There was a kind of oogi made from thin pieces of pine wood. Haiku is a useless thing, a haiku poet is a useless person. Karo-tosen is an old Chinese saying which has been adopted in Japan, though seldom, if ever, used nowadays. Karo means a fireplace in summer and tosen means a fan in winter. What is the use of a fireplace in hot summer? What is the use of a fan in bitter winter? The saying should now be self-explanatory. Yes, it is to describe something useless or uselessness of things. And we haiku poets had better be, and are, karo-tosen. Towards the end of April (lunar calendar) of the year 6 Genroku (1693), one of Basho’s disciple, Morikawa Kyoriku (1656-1715), was preparing for his return journey to Hikone Domain (in today’s Shiga Prefecture) where he served as a high-ranking retinue. Kyoriku had been staying in Edo since August of the previous year. He was in company with his Lord, who was serving sankin-kotai obligations in the seat of the Tokugawa government. Sankin-kotai was a duty imposed on feudal lords requiring them to live part-time in Edo and part-time back in their provincial domains, while their wives and children were required to permanently live in Edo. This arrangement was a key policy of Tokugawa to keep his retinues under tight control. ‘My haikai is like karo tosen’, namely ‘useless’. What are we to do if Basho says that his poetry is useless? His was not an idle remark of self-mockery or of amusing Kyoriku in a light-hearted way. It was mentioned after a long and hard navel-gazing reflection on his life. There have been numerous academic studies on this point. Quite apart from them, it certainly provides us with enormous food for thought. Let us look at some of its ramifications.
. Fuji no kaze ya oogi ni nosete Edo miyage . I drink sake in the shade . . . Here Basho mimics a noh actor; when the play calls for drinking sake (rice wine), the actor mimes the motions using a closed folding fan as a prop.
. WKD : POEMS WITH TWO SEASON WORDS .
. hatsu oogi 初扇 (はつおうぎ) first use of the folding fan .
. oogi matsuri 扇祭（おうぎまつり) hand fan festival . main festival at shrine Nachi Taisha, July 14.
. karasu uchiwa 烏団扇（からすうちわ）"craw fan". "feather fan of a Tengu" . Added with the wish for "suehiro" 末広（すえひろ）"to fold out", an auspicious play of words with something good lasting for a long time. May the girl lead a plentiful life. at Enryuji Temple, Mikawa-cho, Hiroshima City. Toukasan [とうかさん], the most festive of Hiroshima’s downtown festivals, dates back around 400 years. It signals the start of summer and locals mark the occasion by giving traditional lightweight summer kimono, called yukata, their first outing of the year. Everyone from young punks to pensioners loves toukasan and the streets are packed and ablaze with color. Most will line up at Enryu-ji Temple at the end of Chuo-dori – recognizable by the many many read lanterns that hand over the forecourt (not to mention the long line that spills out and down the street during the festival) – to pray to Touka Daimyoujin for good fortune, but Toukasan is as much about showing off your yukata, sampling the street food and playing festival games as it is about religious ritual. Touka is an alternative reading for the characters of the Shinto god Inari – the kami of rice, prosperity, fertility as well as other good stuff like tea and sake. Inari shrines are distinguished by multiple torii gates and statues of foxes – the most famous being Fushimi Inari Shrine in Kyoto – and you’ll often find them within the grounds of a Buddhist temple, as at Enryu-ji, among other temples, here in Hiroshima. The festival was originally held on the day on which Boys’ Day fell according to the old lunar calendar. As that could be anywhere from early May to late June in the Gregorian calendar it was decided that it would be held around the 10th of June (the 10th of the month also being referred to as touka in Japanese). Pressure from traders saw the festival extended to two and then three days – Inari is the god of prosperity after all. Since 1999 the festival has started on the first Friday of June, ensuring a full weekend of enlightened cash flow. After paying your respects, make a ¥300 offering and get a yakuyoke uchiwa fan. 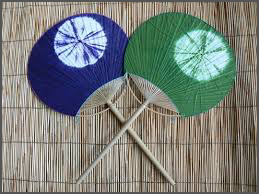 According to the temple website these fans are the embodiment of Touka Daimyoujin herself, and the most effective talisman for warding off misfortune in all of Japan. Guaranteed to be effective aid to health, wealth and longevity. Quite a bargain. personal yakudoshi 厄年 "years of personal calamity"
. WKD - Hiroshima Festivals .
. chuukei 中啓 Chukei, ceremonial fan of a priest . Thank you a lot of fun of fun. I could enjoy your information on fun. I will come here soon for getting your help. ogi as a new year present in a box, which was then sold again when New Year was over. This hokku is from the summer of 1824, the time period when Issa got married to his second wife and was very soon divorced by her. He was sixty-two, and she was thirty-eight. Two years earlier Issa had had a bad fall and injured one leg, so it's possible that he was using a cane at this time and that this is a first-person hokku. The man in the hokku walks slowly with his cane, and he cares little about his appearance, sticking the handle of his stiff round or oblong fan under the sash that goes around his waist. He seems to be wearing the sash a bit loosely or sloppily, and the fairly long fan handle extends down below the sash and rests against one hip. As he walks, the fan handle slowly moves to the rhythm of his leg and cane. Elsewhere Issa indicates that this informality was normal for older people, presumably because they often needed to use a cane or to walk together with someone. The photo at the link below shows a casually dressed man with his back to the camera watching an early fall festival taking place below many red lanterns. Inside the orange circle drawn on the photo by the amused Japanese photographer you can see the man's fan resting against his lower back, held in place by the fan handle, which is stuck under his belt. The fan handle extends down onto his left hip. Since the end of the Edo period. 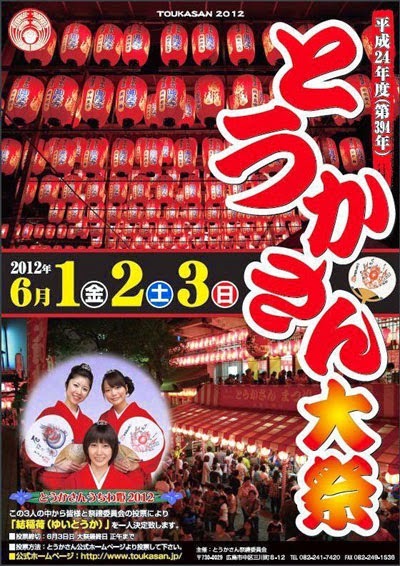 They have an auspicious form of 末広がりで縁起 "suehirogari" opening up good luck for a long time. Many farming families made these kites in the winter time to earn some extra money. Now Fujimi has a perservation group for these kites 郷土民芸扇だこのつくりかた. Together with the Daruma kites from Kawagoe they are now well loved. John Scarlett writes, "What a poignant reminder of how until we recently entered the age of fossil fuels, we were very dependent in both peace and war on the well-being of fellow creatures such as the horse. After my 43 years of using oxen instead of a tractor ended last fall because of my failing health, I find myself grieving not only for the empty pastures and unmowed meadows but even more for those powerful, gentle creatures. More than once I 'pulled their tongues,' as the saying goes, when the oxen became overheated while haying or logging and their tongues would hang out--a time when you had to stop immediately and let them cool off for several hours, even taking them to a beaver pond to lie down in. I hope the general was waving that fan with vigor."